When you enter the first floor, there are two guest bedrooms – one with a king bed and the other with two queens. There is a full bathroom with double vanities and Jacuzzi tub/shower, a large owner’s closet, and two oversized separate storage closets on the first floor. The two-car garage with additional storage closet is located on the 1st level as well. Up the wood stairs to the second floor, you will find two more guest bedrooms on the back of the home overlooking the lake. Each bedroom has a bathroom and access to the oversized balcony. 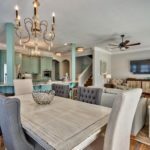 A large open kitchen, living room and dining area are located on the front of the home with an enormous porch for outside entertainment and dining as well as Gulf views. 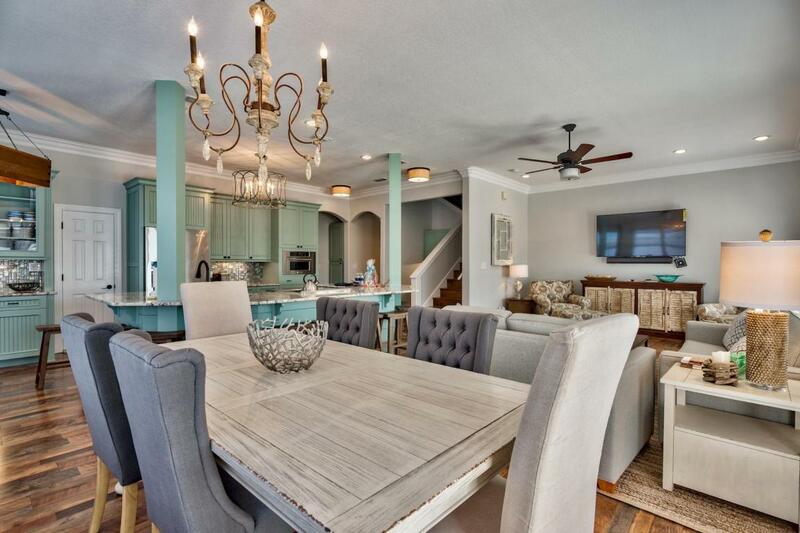 The kitchen has a horseshoe breakfast bar, ice maker, and a separate wet bar with wine fridge. There is a full-size washer and dryer on the second floor as well. 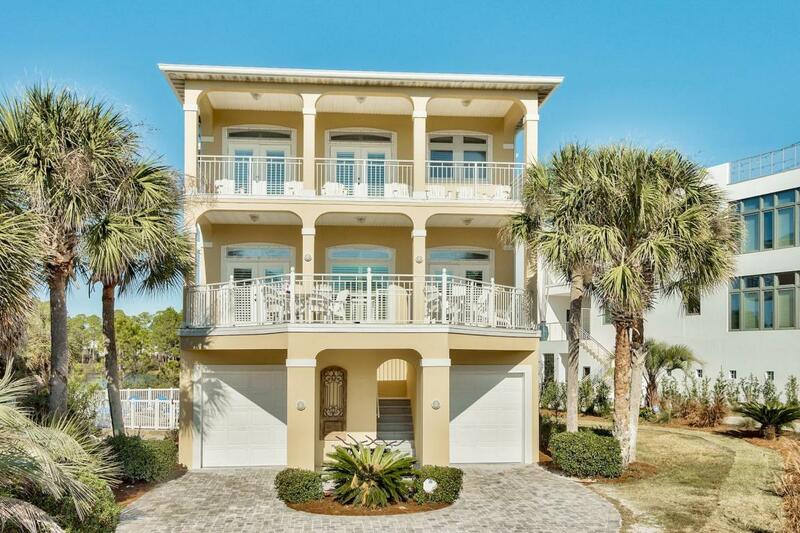 The top floor has three additional guest rooms in addition to the master bedroom on the front of the house facing the Gulf. The master bedroom has a huge walk-in closet, and the master bathroom has dual vanities, a separate jetted tub, and shower. 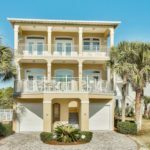 A large private balcony is connected to the master bedroom and has amazing Gulf views. This is a very enjoyable spot to soak in the sun and amazing sunsets! The two rear guest bedrooms have private balconies overlooking the lake behind the home. 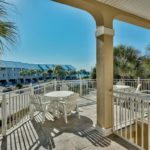 This wonderful vacation home is located on a quiet cul-de-sac across the street from the Gulf of Mexico and next to Deer Lake State Park. The home comes with hurricane shutters. There is additional common area parking in the cul-de-sac providing plenty of room for all of your guests! 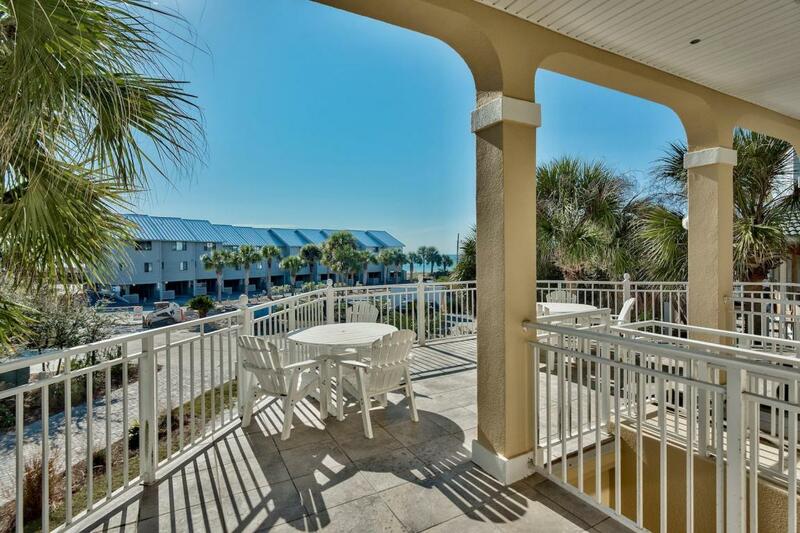 The wide, white sandy beaches are just steps away from the home providing easy access.